At MarylandCAN, we believe all kids CAN succeed. Through our Opportunity Schools report series, we highlight ways schools have helped even the most disadvantaged students beat the odds. 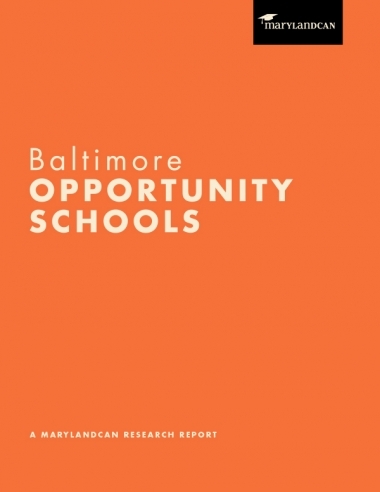 Explore our findings on elementary, middle and high schools around Baltimore and the country that are breaking the link between poverty and low achievement. In Baltimore, we found eight schools that are leading students from low-income households to outperform overall state proficiency rates. Through our Opportunity Schools campaign and report we aim to celebrate the schools’ successes and pull lessons that we can use to make better policies and create more poverty-defying schools. Behind every one of these great schools is a talented school leader whose best practices and voices we want to amplify. We will advocate for the policies and practices we learned by studying and visiting these exceptional schools and leaders.